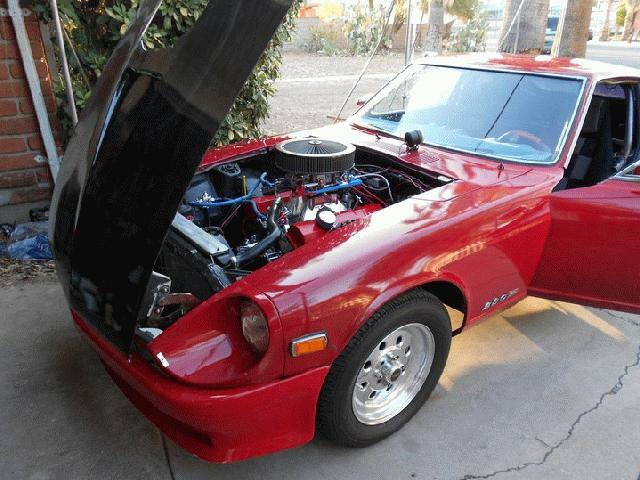 1977 280 Z small block chevy 350 standerd bore,automatic,cage, mt street radials,new nos,never used, street legal...so much more,rac/pinion,4 adj coil overs,dries sweet..... 9.70 1.25 60 foot 140 mph pictures tell alot...about 95% done...in my case it will never be done BUT as now ready to drive and race... HAS CURRENT PLATES etc....has factory A/C from fire all back (untouched) add a compressor/evaparotor. new everything even new Quick fuel 850 cfm carb, ls7 type type intake.msd, auto meter ulta lites.hey i does need a cd player-didnt put one in yet. b&m quick silver, 373 gears locker duel 3 inch exh/magna flows...has a open cross member so droping the pan is a snap, even have a new 8 qt swing oil pan and pick up/pump...i havent got to yet included, hdy cam. has i didnt want to mess with the vavles,alum heads/intake hoged out...alum rad, billet alum elect water pump, thermostat elect.fan 140 amp ap, 10 an earls fuel...swing out drivers roll bar.didital tack/shift light..spicer u joints,weld drag lites. bralle 1330 amp dry cell(also new and rod turn off...ALL NEW..about 10 miles on car as of now..locking steering wheel,all lights work,turn signals etc...glass hood, will thow in a aro scoop also, headlight areo covers. weights about 2600 lb..pulls hard and drives as nice as my vette...look at the picture..it needs a little more tricking out to really be top of the line.... i have to sell due to a injury..